The NCR Ranger on the cover of Fallout: New Vegas is the baddest-looking dude in videogames and if you want to look just like him, "aspiring prop designer" Jai Norman is here to show you how. Halloween is a long way off but if you're looking to dress up as your favorite New California Republic tough guy, you might want to get going on it now. It took Norman, who seems to have some idea what he's doing, more than a month to put this thing together, after all. But the final result clearly demonstrates that it was time well spent. The level of detail that's gone into this outfit is just fantastic. From the battle-scarred pre-war LAPD riot armor to the holes torn into the shoulder of the duster and even the kill marks on the helmet, it's an incredibly accurate recreation of the imposing NCR ranger on the cover of New Vegas. 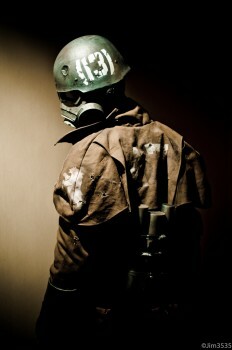 The only significant difference is the number on the helmet; Norman said he's a fan of the original Fallout games and thus made a point of putting the number 13 on his headgear. My favorite part of the build, oddly enough, is actually a supporting prop off-handedly wedged into the middle of the process: a New Calfornia Republic flag cobbled together from two real-world California flags and a stencil, which I think gives it a very authentic flavor. For those who want to take a stab at making one of their very own, Norman was kind enough to post numerous photos of the building process, along with some great shots of the finished outfit, in a long thread on the Replica Prop Forum. Good luck - I think you might need it.